Does the "ih" in your username mean the same thing as "meh"? I type "ih" rather than "meh" because that's how I SAY the word. No. I don't know why, but at some point, my username shortened from Allthegoodusernamesweretakensoihadtotakethisone. Would you know why it shortened? Nope, but you could e-mail imgflip about it, if it really bothers you. There's an actual book called "Sir Cumference and the First Round Table!" My math teacher read that to us in the 7th Grade! I was read that in 3rd grade, lol. Did he wear a "Pi"bald tunic? Congratulations! 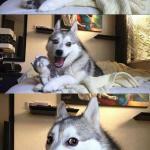 You made a Bad Pun Dog meme that's actually funny. Lmfao! I'm watching monty Python and the holy grail right now. Wow. Top 2 memes on Imgflip right now are by you. Nice job! Sir Cumference will never be as round as the OGRELORD! People who don't appreciate trolls coming here and ruining Imgflip for the rest of us normal people? This is funny to watch.